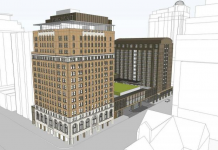 Rogers Real Estate Development Limited, a private holding company owned by the Rogers family, has announced a $1.5 billion project in downtown Mississuaga. M City—a 10-tower, 15-acre, 4.3 million sq. ft. master planned community—includes more than two-acres of public parkland in the downtown core, the announcement says. It is the Rogers family’s first major residential condominium development. The project has been in development since 2007, when Rogers Real Estate Development enlisted developer Urban Capital Property Group to manage the process of turning “a long held family asset into a legacy community,” the news release says. 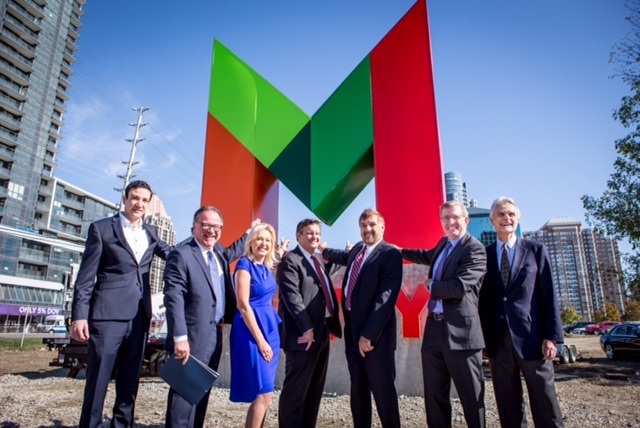 Just announced M City will be future site of 10 new buildings in Mississauga (left to right): Councillor John Kovac, Ward 4; Councillor Nando Iannicca, Ward 7; Mayor Bonnie Crombie, City of Mississauga; Edward Rogers, Deputy Chairman, Rogers Communications Inc.; Edward Sajecki, Commissioner of Plannning for the City of Mississauga; Mark Reeve, Partner Urban Capital; Donald Clinton, Partner Cooper Robertson. New York-based urban design firm Cooper Robertson was brought on board to design the framework for M City. Cooper Robertson partner Donald Clinton was the project’s lead designer. With frontage along Burnhamthorpe Rd. and connections north and south along Mary Fix Creek, the M City site enables a range of urban settings. 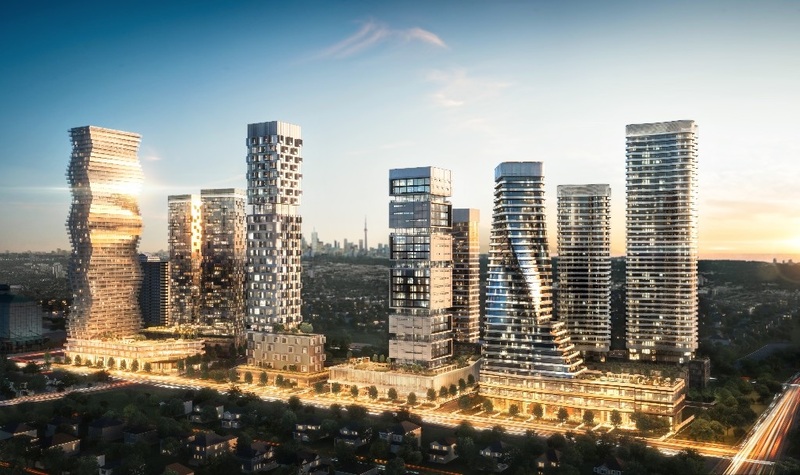 M City will launch with a first tower after Rogers Real Estate Development Limited and Urban Capital held a design competition with three of Canada’s top architecture firms. CORE Architects delivered the winning design with an undulating tower that rotates seven typical floor plates in repetition as it rises 51 storeys. CORE Architects has designed over 200 million sq. ft. of residential development across North America and internationally. “It is our hope that M City acts as a catalyst for the continued evolution of Mississauga’s downtown. It’s why we have taken on the challenge of developing this property. Being able to introduce over two acres of parkland is a part of the legacy we hope to leave behind,” says Rogers.